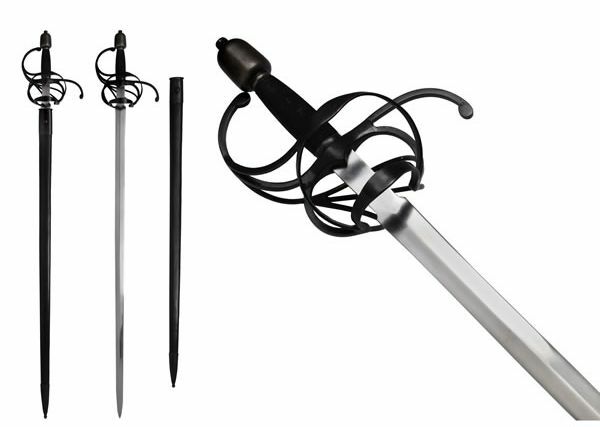 38.5 inches (98cm) in length overall, and has a sharpened 32.5 inch (82cm) EN45 sprung steel blade. Handgrip is wire bound over oak wood, and is finished with a very ornate shell guard. 38" Overall with a 31" sharpened, hand forged spring carbon steel blade. Full tang construction with hardwood handles. Traditionally made in a small forge, complete with leather over wood scabbard, nice item. 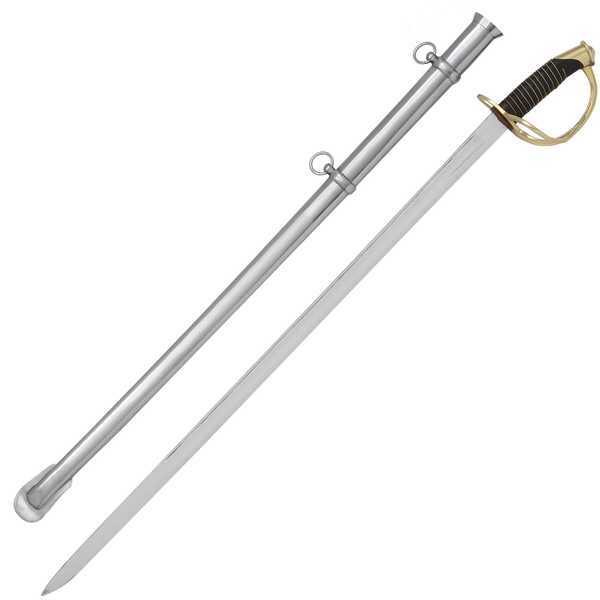 41.5" Overall with an unsharpened, stainless blade. 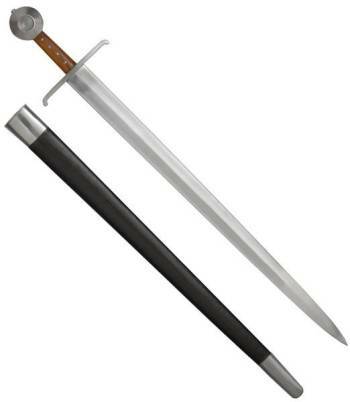 Stainless crossguard and pommel and a dark brown leather wrapped, wooden handle. 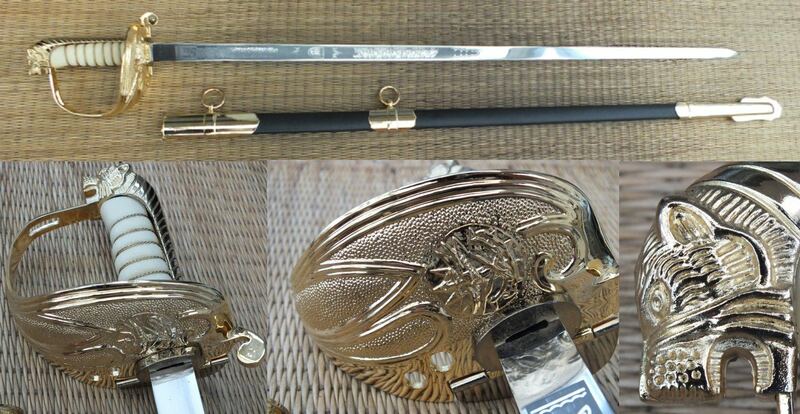 Leather wrapped wooden sheath with stainless fittings. Good example of a hand and a half. 46" Overall with a 37" sharpened, EN45 carbon steel blade. 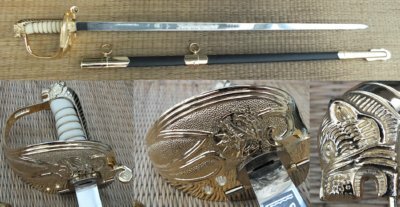 Hardwood handle with a superb full wire wrap, darkened steel fittings, hardwood scabbard with a darkened finish and steel fittings,. Stunning example of a fine English Sword, looks and feels very much like an authentic antique with its aged finish. Full Tang, Hand Forged EN45 carbon steel blade with a sharpened edge, bone handles and cast metal fittings with aged brass finish. 29" Overall with a 21.5" blade. Wooden saya with leather cover and brass fittings. 37 1/2" overall. 29" stainless unsharpened blade. Black metal handle with silver wire wrap. 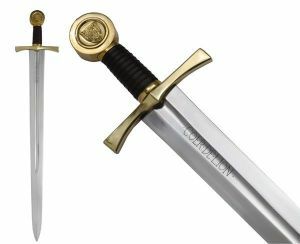 Polished steel guard and pommel. 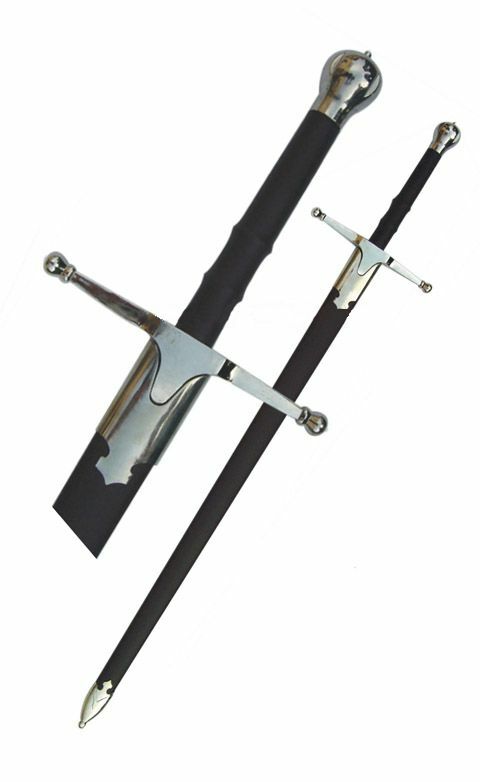 Black leather covered scabbard with polished steel trim. 39" Overall with a 28" unsharpened, double edged carbon steel blade. Metal crossguard with blue lacquered wooden scabbard.